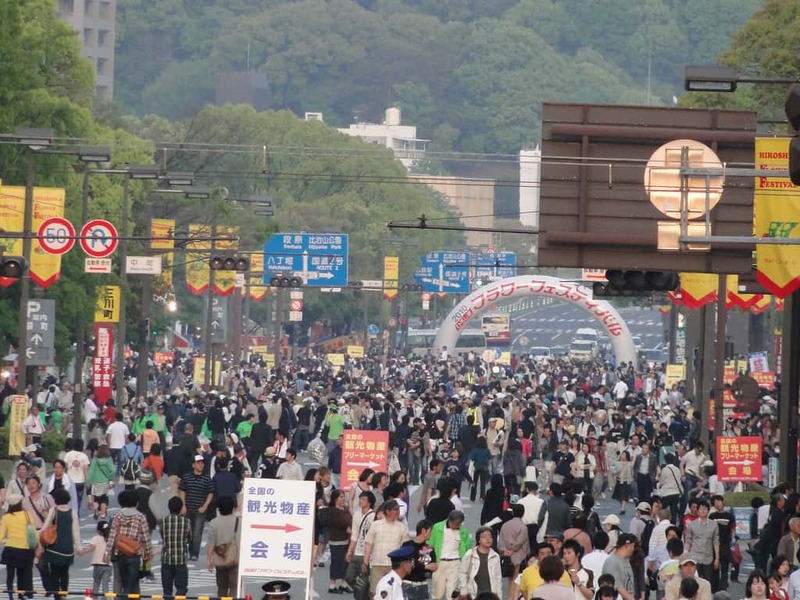 Every year, between May 3 and May 5, Hiroshima’s 100m wide Peace Boulevard is closed to traffic and given over to parades, dancing, stages and stalls. The Flower Festival, with its carnivalesque atmosphere, draws over a million people every year. There are countless stages and the schedule is very confusing (and in Japanese). Hopefully, this guide will help you make some sense of the mayhem, or, if you are feeling brave, download the official 2017 Flower Festival PDF guide here [ja]. 2017’s festival is the 41st and the theme, thought up by a 71 year old Iwamuni man is hana ippai, habatake heiwa no, saku mirai [花いっぱい はばたけ平和の 咲く未来] which means something like “An ever peaceful future filled with flowers”. The symbolic “Flower Tower” made of some 8000 blooms and which stands in front of the Peace Museum during the festival will be adorned with the image of a huge bouquet (a design by a 36 year old cook that was selected from 205 entries). 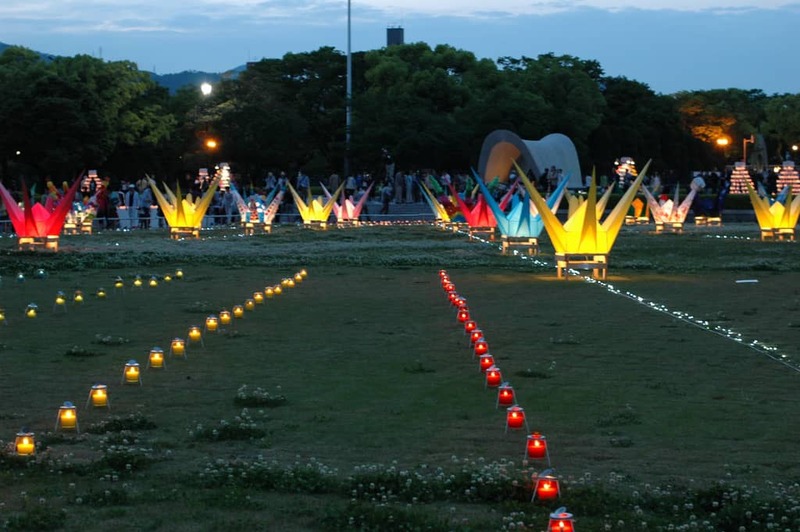 The event opens with the Flower Parade starting just after 11:00 on May 3 from the Takara-machi intersection on Peace Boulevard (near Fuji Grand) and which makes its way to Peace Memorial Park. The parade will be led this year by the boy’s and girls ekiden relay teams from Sera High School which both won their respective national championships this year. The teams will be bearing a torch along the route. Following them, community groups, companies, floats, Harley Davidson bikes and the “Flower Float” bearing this year’s Flower Festival Queens. See the whole list, in Japanese, here. Although, for much of the first and third days of the Flower Festival, Peace Boulevard is closed for parades and the sidewalks get very crowded, the the main street is open all day on the middle day and it’s much easier to get around the event. The parades on day one and three are usually over by about 3pm, from when the road is opened to the public. The area around the main Carnation Stage in front of the Peace Museum also gets very busy during the main events and for the big guests (sometimes fans camp over night to a choice spot in front of the stage. 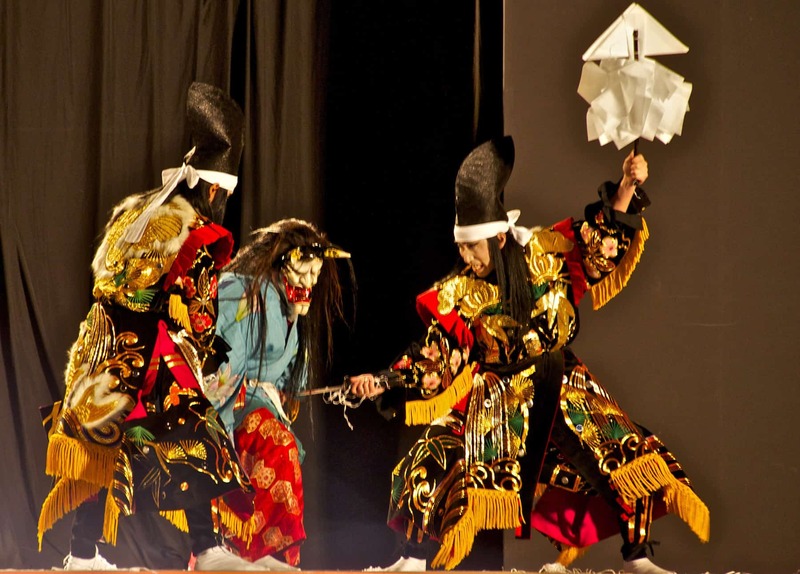 That said, other you can usually get a view of other events such as the kagura performances on the Carnation Stage on the first evening as people in front tend to sit on the ground. 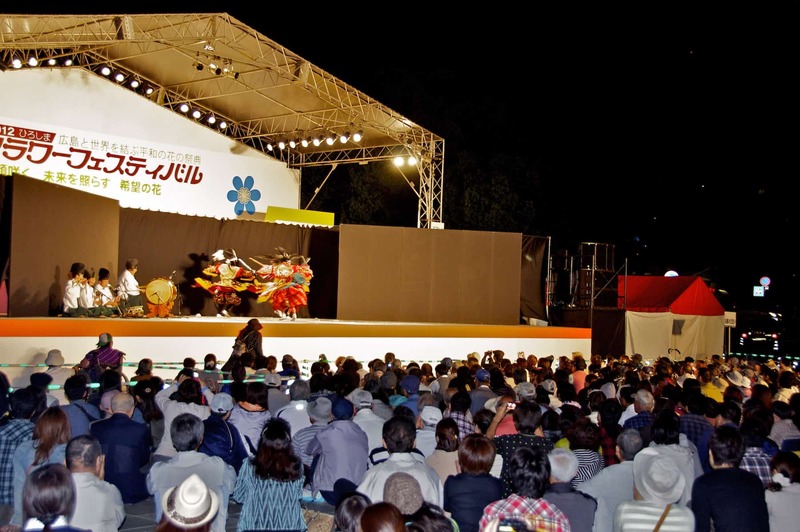 Most of Day 3 is taken up with Yosakoi performances, first on Peace Boulevard and then on the main stage. It can get a bit much after a while, but the Yosakoi Dance Parade is GetHiroshima’s jjwalsh’s favorite part of the Flower Festival and she loves getting there early to secure a good vantage point on the curb (usually on the north side of Peace Boulevard to stay in the shade for as long as possible) and taking photos of all the colorful dance groups. If you want a break from all the heavily choreographed and somewhat corporate atmosphere of the festival, head over to Skate World. Just behind the main Carnation Stage, next to the river is a mini skate park put together by local skaters and their mates with soundtrack provided by DJs and bands playing on the back of truck. Delightfully anarchic, but be careful, I got a board in the back of my neck while I was nodding along to some reggae a couple of years ago. Kids are welcome, though, unless they know what they are doing, it’s best that they play around on the ramps earlier in the day. The Peace Flower Project installation in the Peace Memorial Park is a little more gaudy these days than the original candle event which it has evolved, but the park still looks very picturesque after dark when illuminated by candles and the peace crane lanterns. It provides a peaceful and contemplative contrast to all the crowds and noise during the day. As mentioned above, the schedule is pretty confusing (and in tiny type! ), so it makes sense to play things by ear and follow your nose! There’s an awful lot of community groups doing hula or flamenco and school-age hip hop dancers, but you never know what you might come across. The parade starts in front of the Oriental Hotel and makes its way to peace boulevard. If you plan to try and grab a spot along the route, please be aware that the groups will not be stopping to do their regular performances at the large intersections or on the Peace Bridge. See our round up of the pick of the musical guests at the 2017 Flower Festival here. Japanese 400m hurdler Dai Tamsesue and other speedy athletes take on challenges from the crowd in a mini Flower Festival track meet in front of Peace Park. Pole vault demo, athlete’s “talk show”, elementary school 50m sprint heats, sprint and high jump demos, athletes vs kids and prize giving. 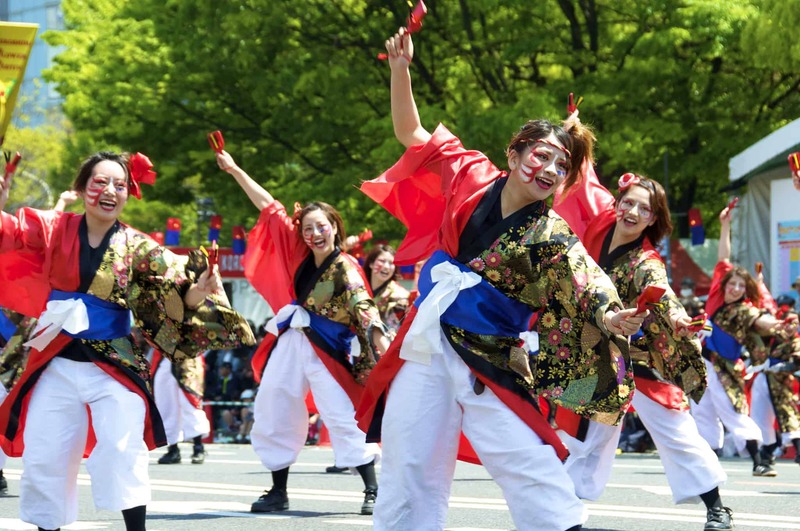 The final day of the Flower Festival is all about dressing up brightly colored robes, painting your face and doing the energetic yosakoi dance – all day long. The winners perform at the end of the day on the main Carnation Stage in Peace Park. Great for photos! If you think we’ve missed anything important or have any tips that could be added to this guide for coming years, please post a comment below, on our Facebook Page or email us at [email protected].